Looking for the best wedding photographer in Derbyshire? I have been photographing weddings for many years, in many counties across the UK with most of which being in my home county of Derbyshire or Leicestershire. One of my favourite things to do when it comes to wedding photography is to take a new, fresh look at things. A lot of wedding venues have become conveyor belts for weddings, with some venues doing up to 280 wedding a year back to back. With this in mind, there's always a risk that your wedding photos could look like that of the couple who got married at your venue the day before, or the day after you did. For this photo from David and Laura's wedding I wanted to do something that I've not seen anyone else do here before. 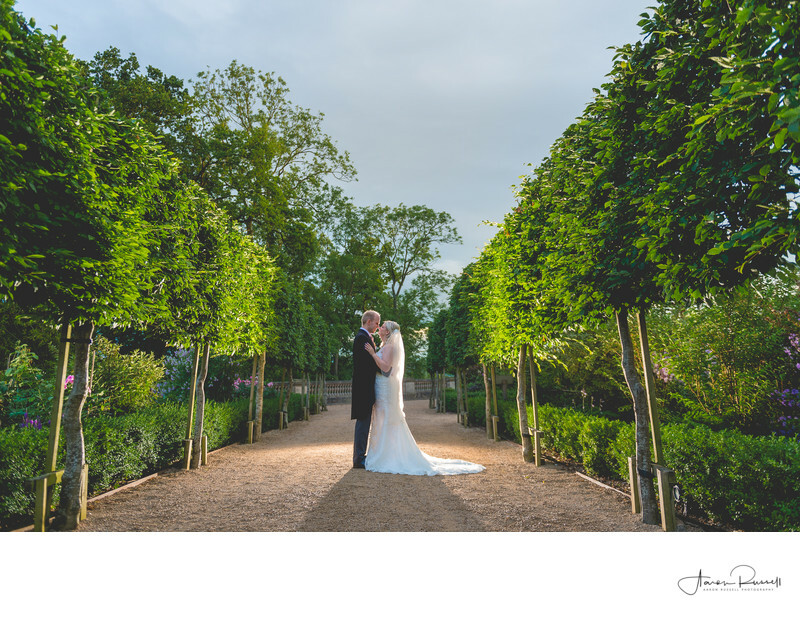 There was an avenue of trees that I used to frame the couple in the image, and I placed a flash behind them in order to help lift the bride and groom from the dark background. This light also provided illumination for the trees at either side of the couple, as well as the light shining brightly through the brides wedding dress, making it glow in the early evening conditions.